of a beloved, ancient coastal rainforest, the Elliott State Forest. take a stand against the dozens of clearcuts on the table for 2011-2012.
know your rights, and anti-oppression. Please come self-sufficient for camping with food and water/water filtration system. We will have some resources but not for everyone and town will be an hour away. You can use the rideshare board at the top of the blog for carpooling. off of 5th near the Amtrak Station, on Friday a.m.
We will have directions there and possibly open seats. Call Thomas at (530)521-4991 if you have other questions. Turn right on Road 1000, called "Elk Ridge Road"
Stay on this road for a long time, don't take any turns or forks. Drive slow and careful on loose gravel. Turn right at 2300, called "Beaver Creek Road"
Drive until the road crosses a river on a small concrete bridge. Look for a large flat area with paths and a makeshift camp. Highway. Stay on 38 towards Reedsport. From Allegany get on Road 1000, called "Elk Ridge Road"
Action Camp was a success! The action camp was amazing. Great people, great place, great workshops, great food, very productive! Now let’s put those skills to work and protect our forests. Please come to a meeting and get plugged in. 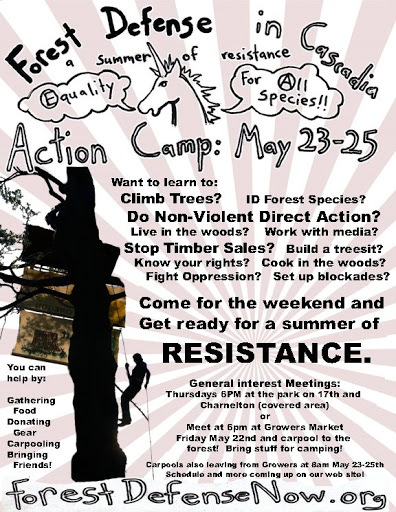 Come out to the forest for a weekend of skill building and get ready for a summer of RESISTANCE! 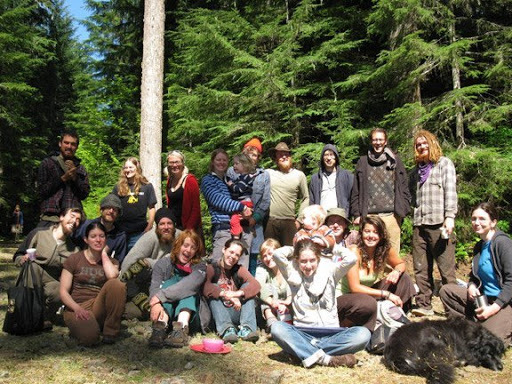 The Action Camp is THE BEST WAY TO PLUG IN TO FOREST DEFENSE IN CASCADIA. So come for the weekend and stay for the summer. On Friday May 22nd we will leave from the Grower’s Market (map) at 6pm and carpool to a forest location just 45 minutes from Eugene. Please bring camping supplies and positive attitudes. Carpools will also leave from Growers on the 23rd at 8am, 24th at 8am and 25th at 8am. Rides will be returning throughout the weekend. Want more info? Send an email to: ForestDefenseNow@gmail.com to sign up for the mailing list. 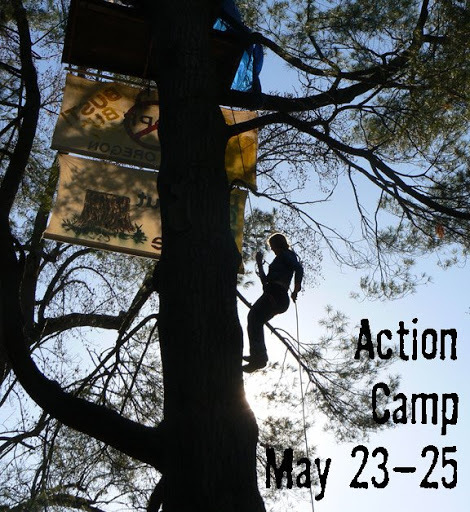 Click here for printer friendly version of the Action Camp Flier.